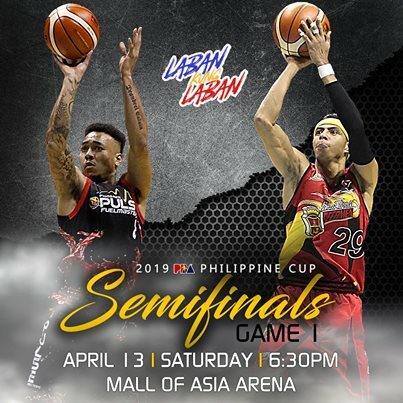 Here are the details for San Miguel Beermen vs. Phoenix Fuel Masters in Game 1 of their best-of-seven semifinals series in the 2019 PBA Philippine Cup. San Miguel downed Phoenix, 100-88, in Game 1 of their best-of-7 series. Alex Cabagnot went 5-of-9 from beyond the arc to lead San Miguel with 26 points. Chris Ross and Marcio Lassiter chipped in 14 points each. Christian Standhardinger contributed 12 points, 16 rebounds, and four assists, while June Mar Fajarde, who had a scary incident in the second quarter, had nine points and nine rebounds. Matthew Wright led the Fuel Masters with 22 points. Calvin Abueva, who struggled in the foul line with 5-fo-15, recorded 18 points and 21 rebounds. Game 2 is set Monday at 7:00 pm. Watch the game highlights as the San Miguel Beermen defeated the Phoenix Fuel Masters, 100-88, in Game 1. The Beermen leads the best-of-7 series, 1-0.